Last spring, my teenage son and I caught the first 6 hours of TUG OF WAR: Foreign Fire. I can't wait to see the grand finale. Theatre of this magnitude and length is nothing short of cathartic. It's a commitment well worth making. The first installment more than earned the adjective, epic, and we expect no less of Civil Strife. Check out our review HERE. Then experience TUG OF WAR for yourself. 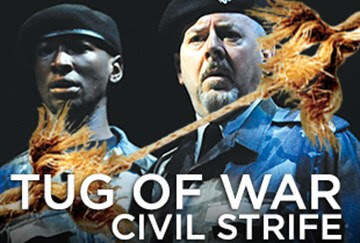 Chicago Shakespeare Theater (CST) culminates Artistic Director Barbara Gaines’Tug of War with Civil Strife, where family divisions launch a country into civil war through Shakespeare’s Henry VI, Parts 2 and 3 and into his notorious tragedy Richard III. This epic theatrical endeavor, which has distilled six Shakespeare histories into two action-packed six-hour marathon dramas tracing the injustice and intrigues of war, is the Theater’s centerpiece of the yearlong Shakespeare 400 Chicago festival. The adventure began in the spring with Foreign Fire—focusing on England’s Hundred Years' War with France in Edward III, Henry V and Henry VI, Part 1. 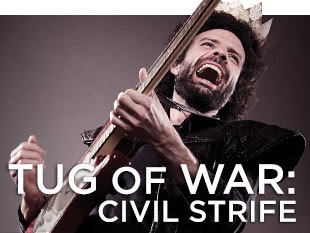 Fueled by live music and stunning staging, Tug of War: Civil Strife is presented on the Courtyard Theater stage for a limited run of only 14 performances, September 15–October 9, 2016. Civil Strife opens in a period of lawlessness and turbulence in England as the country’s leading families—the Houses of York and Lancaster, embroiled in the Wars of the Roses—scheme for the English throne. The Duke of York manipulates the beleaguered King Henry VI’s weakness. The country spirals further into chaos when the King is murdered, and his brother Richard—one of Shakespeare’s most diabolical villains—seeks the crown. Embittered by his own physical deformities, the power-hungry Richard will stop at nothing to gain control of England, seducing and murdering his way to the throne. A new age dawns for England as this chronicle comes to a dramatic close. Featuring some of Chicago’s most celebrated actors, the ensemble cast of 19 performs over 100 characters throughout the electrifying drama. Shakespeare’s stirring poetry is complemented with live music performances across genres, from classics and blues to contemporary pop and rock anthems—including songs from Pete Townshend and Tim Buckley. In the spirit of addictive sagas like Scandal and House of Cards, Tug of Warencompasses multiple episodes of Shakespeare’s stories for a live binge-watching experience. The six-hour theatrical event is punctuated with several short intermissions and an extended meal break, during which pre-ordered meal options are available. Tug of War: Civil Strife introduces Timothy Edward Kane (Richard III), Elizabeth Ledo (Somerset/Lady Anne),Michael Milligan (Young Clifford/Rivers/Tyrell), Derrick Trumbly (Peters/Salisbury/Stafford) and Alison Chesley(Soldier/cello) to the ensemble. Returning to the company from Tug of War: Foreign Fire are Karen Aldridge, David Darlow, Matt Deitchman (also the production’s Music Director), Jed Feder, Kevin Gudahl, Shanna Jones, Heidi Kettenring, Daniel Kyri, Michael Aaron Lindner, James Newcomb, Steven Sutcliffe, John Tufts and Larry Yando. Seven-time Jeff Award-winner Lindsay Jones serves as the production’s Sound Designer and also creates Original Music and Musical Arrangements for the piece, working within the wide range of musical styles and performance central to Gaines’ vision. The award-winning team of Scenic Designer Scott Davis, Costume Designer Susan Mickey and Lighting Designer Aaron Spivey have re-imagined the physical world of the saga for Tug of War: Civil Strife, complete with dramatic new effects from Projections Designer Mike Tutaj and Special Effects DesignerSteve Tolin. Wig and Make-up Designer Melissa Veal has created a line-up of over fifty wigs and hair pieces—many of which have been built especially for the production. Rounding out the creative team is Music Director Matt Deitchman, Assistant Director Geoff Button, Fight Choreographer Matt Hawkins, Movement Director Harrison McEldowney and Verse Coach Kevin Gudahl. Scholar Stuart Sherman, Professor of English at Fordham University and currently Bain-Swiggett Visiting Professor of Poetry at Princeton, serves as the Scholar-in-Residence for the project. Tug of War returns in the midst of one of the busiest months of the Shakespeare 400 Chicago festival, with every day of September featuring events and performances across disciplines, and from renowned companies from China, Poland, Mexico and India. From Poland, Song of the Goat presents their ensemble-driven Songs of Lear, exploring the rhythms of Shakespeare’s King Lear. One of Mexico City’s most innovative theater companies, Foro Shakespeare partners with acclaimed Chilean playwright Eduardo Pavez Goye to create Enamorarse de un incendio, drawing on Shakespeare’s Romeo and Juliet. India’s Company Theatre Mumbai presents their award-winning Hindi translation of Shakespeare’s Twelfth Night, Piya Behrupiya, as part of the 2016 Eye On India festival. Internationally renowned Shanghai Jingju Theatre Company transforms Shakespeare’s Hamlet into highly stylized and ornamental Peking opera with The Revenge of Prince Zi Dan. Culinary Complete Works chefs headline the prestigious Grand Cru at Bon Appétit presents Chicago Gourmet; The Newberry launches the “Creating Shakespeare” exhibition and, along with Chicago Shakespeare, present a lecture series from award-winning scholars; the Battle of the Bard high school Shakespeare slam bringing together students from Chicago Public Schools and across Chicago; and more. For more information about the production, visit www.chicagoshakes.com/tugofwar. Tug of War: Civil Strife will be performed in CST’s Courtyard Theater September 15–October 9, 2016. For more information or to purchase tickets, contact Chicago Shakespeare Theater’s Box Office at 312.595.5600 or visit the Theater’s website at www.chicagoshakes.com.